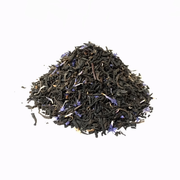 Yummy black tea with lichee fruit and vanilla flavorings, accented with striking blue corn flowers. 1 of 3 Lichee Teas in our selections. Some may remember it as the Blue Willow Lichee Black Tea.